We've been a bit preoccupied with the autocomplete stuff as of late and have been skimping a bit on the strange maps. 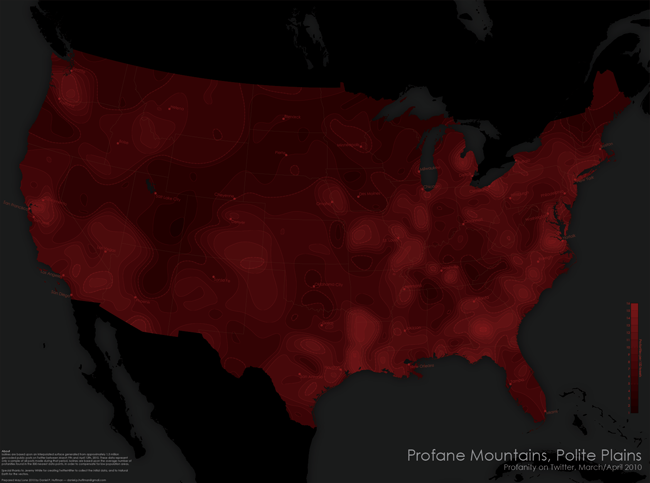 So, to set things in a different course (for a bit) we wanted to repost the map of Twitter profanity that Daniel Huffman created. You may have seen it about a month ago but we thought it was worth highlighting again. Especially for a zoomed in look at Kentucky which looks a little more profane than Ohio. Not sure if that's something to lament or celebrate. A high quality version is available here.